These unusual beads are for the inner child. Each bead measures 11mm x 8mm. Price is per 14-inch strand. 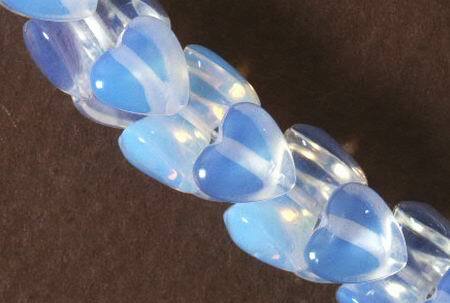 Moonstone is translucent, and softens the light shining through it to give a pearly moon-like glow. This distinctive shimmering affect called adularescence, is caused by the way the stone reflects light. Moonstone comes in colorless, white, grey, and subtle yellow or peach, but always has a blue or white sheen. Rainbow moonstone is colorless with a blue sheen and a rainbow-like array of colors ¿ a very attractive semi-precious stone.